Music fans in North Carolina’s Piedmont Triad have had the good fortune for years to have regular opportunities to hear the Vagabond Saints’ Society. The all-star band, led by Doug Davis, pays tribute to great artists from rock history, including Prince, David Bowie, Bruce Springsteen, Queen, Cheap Trick, and many others. 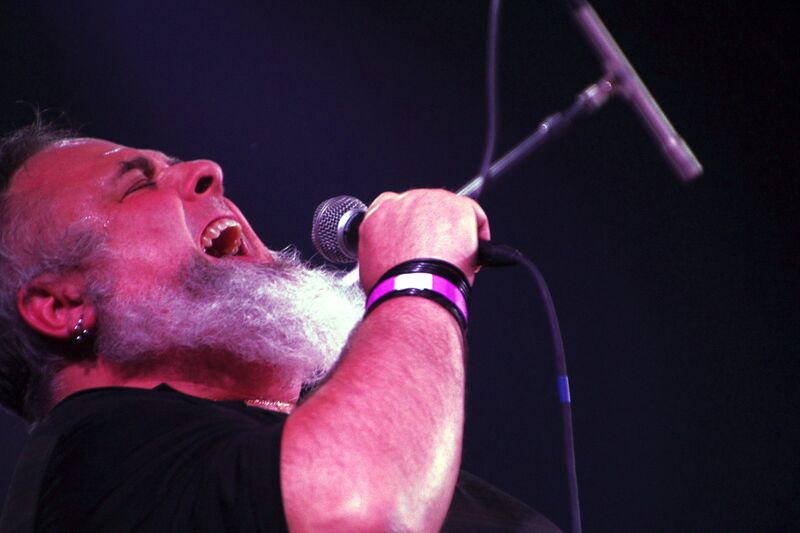 For January and February 2019, they made their most ambitious plans to date: a show of Tom Waits songs they would take to venues from Wilmington, N.C., to Johnson City, Tenn. Mitchell Snow, a VSS veteran from the group’s early days, returned from his current home in Toronto to handle the bulk of the lead vocal duties. Unfortunately, a medical emergency intervened. Snow had a cardiac emergency a few songs into the first show in Johnson City. Some quick-thinking medical pros in the audience helped save his life, and he’s now recovering after surgery and doing well. The VSS had to cancel the rest of the Waits shows. Mitchell Snow heard the comparisons so often that he avoided singing Tom Waits songs for years. Snow has finally embraced the stylistic similarities – at least for a few concerts. He will handle the main vocal duties when Winston-Salem’s Vagabond Saints’ Society (VSS) returns to Greensboro Feb. 1 for a show of Waits songs in the Crown at the Carolina Theatre. VSS has been around for well over a decade, paying homage to some of the biggest names in popular music history (Prince, David Bowie, the Beatles) and more obscure favorites (XTC, the Velvet Underground). A core group of musicians led by Doug Davis plays behind a stream of guest singers. Most of their past performances have been in and around Winston-Salem, though VSS has brought two previous shows to the Blind Tiger in Greensboro: Tom Petty and Chicago. For Waits, they’re doing a full-fledged tour that includes the Crown show as well as performances in Johnson City, Tenn., Wilmington, Raleigh, Charlotte and the Ramkat in Winston-Salem Jan. 26. Waits released his debut album in 1973 and has recorded a couple dozen records in the 46 years since. He is also an actor who has appeared in films such as “Rumblefish,” “Down by Law” and “The Ballad of Buster Scruggs,” the recent collection of Western shorts by the Coen Brothers on Netflix. Davis’s “showpiece” characterization comes from Waits’s unique style combined with Snow handling most of the lead vocals (along with acoustic guitar). Snow is a Davie County native and founding member of VSS who played in several bands with Davis, but he moved to Toronto years ago after marrying a Canadian woman. This will Snow’s first time back with VSS in nearly 10 years. He previously sang lead on shows featuring the songs of other performers with distinctive, unconventional vocals: Bob Dylan and Nick Cave. Other members of the band include Davis on guitars and vocals; Randall Johnson on standup bass; and Corky McClellan on drums and percussion. Davis usually concentrates on keyboards, but guitarist Jerry Chapman couldn’t make the Waits tour, so Davis shifted into the guitar slot. The keyboard player for the Waits shows is Jack Gorham, a High Point resident who manages Collector’s Antique Mall in Asheboro. He first played with the group in 2016 when VSS honored “The Last Waltz,” the farewell concert by the original lineup of The Band. Like Snow, Gorham has been compared to Waits without previously knowing his music. As much as he appreciates the comparison, writing his own keyboard parts for the songs has been a challenge. Gorham will play piano, organ, accordion and an instrument new to him: marimba. The Waits shows will begin with a brief overview of Waits’s early music and feature a series of guest vocalists from the cities where VSS is performing. Snow will take the mike for the rest of the show, a deep dive into the albums Waits has made beginning with such early 1980s classics as Swordfishtrombones and Rain Dogs. “It’s all when he got weird, onward,” Snow said. This week I’ll hit the road to talk about John Prine: In Spite of Himself in the North Carolina mountains, then return home to Greensboro this weekend to talk about it some more – with some friends helping out in Greensboro by singing a few Prine songs. I’ll be in good company from the highlands to the Piedmont, yakking with veteran musicians and producers Jim Rooney and Chris Stamey, as well as authors Elaine Neil Orr and Emily Edwards. Up first is the annual conference for the Southeast Regional Folk Alliance, which takes place in Montreat, N.C., May 16 – 20. At 4 p.m. Thursday I will have the great honor of joining Jim Rooney for a panel called “Writing About Folk Music.” Prine fans will recognize Rooney as co-producer of some of the singer’s finest albums, including Aimless Love, German Afternoons, John Prine Live, In Spite of Ourselves, and For Better, or Worse. He also managed the legendary Club 47 in Cambridge in the mid ’60s, served as director of the Newport Folk Festival, and produced the first New Orleans Jazz Festival 50 years ago. Rooney’s memoir, In It for the Long Run: A Musical Odyssey, is an entertaining and enlightening look back over an incredibly diverse career. My adopted hometown will host the first Greensboro Bound Literary Festival May 17 – 20, featuring such luminaries as Daniel Pink, Naima Coster, Stacy McAnulty, Carmen Maria Machado, Kevin Powers, Beth Macy, Nikki Giovanni, and John T. Edge. I will participate in two events on Saturday. At 2 p.m., a panel on writing memoirs and biographies will pair me with Elaine Neil Orr, author of the 2003 memoir Gods of Noonday: A White Girl’s African Life. She also wrote the novels A Different Sun and Swimming Between Worlds – the latter set in Winston-Salem in the 1960s. A musical event will help close out the festivities Saturday night. At 8:30 p.m. I will join Chris Stamey, legendary musician and producer. Highlights of his long and varied career include co-founding the dB’s, power-pop pioneers from Winston-Salem by way of Hoboken; releasing a series of acclaimed solo albums; and producing albums for Whiskeytown, Alejandro Escovedo, Tres Chicas, and others. He recently published a memoir, A Spy in the House of Loud: New York Songs and Stories. It’s part of the same American Music Series from the University of Texas Press that produced my book. After a brief Q&A with me, Stamey will read from his book and play some songs, accompanied by cello and violin. Then Emily Edwards and I will read from our books and offer up music courtesy of our friends Sam Frazier, Big Ron Hunter, and the duo of Skip Staples and Bob Costner. Edwards’s second book, Bars, Blues, and Booze: Stories from the Drink House, was published by the University Press of Mississippi. I wrote about it in 2016 for UNCG’S Research magazine. By the way – the Greensboro Bound events are all free! See you there. There’s a line Bob Dylan sings in “Mississippi” that could be taken as a comment on the work he was doing at that time: “You can always come back, but you can’t come back all the way.” The song appeared on what would turn out to be a late-career masterpiece – even if Dylan’s “Love and Theft” album is now almost old enough to vote. The line applies equally well to John Prine’s new late-career masterpiece, The Tree of Forgiveness, out today. His voice and songwriting will never equal what they were in Prine’s heyday as a New Dylan, during the waning days of the Nixon administration, but his fans couldn’t ask for a more engaging, delightfully wry album from Prine 40 odd years later. Like “Love and Theft,” The Tree of Forgiveness is a mordant reflection on death and dying that’s great fun to listen to, Grandpa gleefully dishing dirt to the kids at a family reunion – or maybe a wake. While Prine’s new record has its bleak moments (the mid-album “Summer’s End” and “Caravan of Fools” in particular), they’re surrounded by steady flashes of his trademark wit, warmth, surreal imagery, and sheer joy at being alive. Prine has survived cancer scares and lost a steady stream of friends and loved ones (some referenced by name in the closing cut, “When I Get to Heaven”), and while he clearly sees the Grim Reaper lurking in the shadows, he mostly flips Death the bird and goes about his business across the 10 tracks of The Tree of Forgiveness. Prine sounds more reverent than ever on The Tree of Forgiveness, even with his customary irreverence never more than a couplet or two away. “When I Get to Heaven” is a laundry list of the things Prine wants to do in the afterlife, from smoking a cigarette nine miles long to catching up with his late brother Doug, parents, and maternal aunts (“’cause that’s where all the love starts”). Several old friends and one comparatively new one helped Prine write these songs. He has been collaborating with most of these guys for decades: Pat McLaughlin, Roger Cook, and Keith Sykes. McLaughlin co-wrote “Egg & Daughter Nite, Lincoln Nebraska, 1967 (Crazy Bone),” the Prine song with the most memorable title since “Sabu Visits the Twin Cities Alone.” It’s a lightly rollicking reflection on mortality worthy of another wry songwriter who routinely laughed in the face of death, the late Warren Zevon. One song, “God Only Knows,” was resurrected from a memorable writing session 40 years ago with Wall of Sound producer-turned-convicted murderer Phil Spector. (Prine and Spector also co-wrote “If You Don’t Want My Love” from 1978’s Bruised Orange at that time.) But Prine and McLaughlin penned “Caravan of Fools” with Dan Auerbach of the Black Keys, who was born the year Prine’s sixth album came out. “Boundless Love,” a sweet song with Prine backed mostly by a subdued organ, is a kissin’ cousin to the title track of the singer’s 1984 album Aimless Love. There’s no mistaking the ravages of time and health problems on Prine’s voice, which was never what you’d call dulcet in the first place. But he and producer Dave Cobb (who has worked with a host of Prine acolytes, from Sturgill Simpson to Jason Isbell) wisely hang it out there in all its ragged glory, with spare accompaniment relegated almost entirely to the background. Name guests Isbell, Amanda Shires, and Brandi Carlile barely register as anything more than background vocalists, hired guns. From beginning to end, The Tree of Forgiveness shines the spotlight on Prine’s lyrics, workmanlike melodies, and joyous croak. Prine sounds simultaneously old as dirt and fresh as a spring flower on The Tree of Forgiveness. It’s easily his best album since The Missing Years 27 years ago, and a welcome surprise half a century into a career never lacking in cheery surprises. My latest radio interview about John Prine: In Spite of Himself is online and ready to stream. I sat down with Eddie Garcia, a producer for WFDD, the NPR affiliate at Wake Forest University in Winston-Salem, N.C., to talk about Prine’s life and music and the process of writing the book. (Garcia is a fine musician in his own right – he plays in a rock band called 1970s Film Stock, and he previously played in a duo called Jews and Catholics.) Listen to Triad Arts Weekend online or catch a broadcast of the show at 4 p.m. Sunday, Dec. 6. Some of the finest singers and songwriters in the North Carolina Piedmont will join me for another tribute to John Prine October 29, this time at Coffee Park ARTS in downtown Winston-Salem. I will introduce a few songs with passages from John Prine: In Spite of Himself, but the musicians will be the stars of PrineFest West. Martha Bassett ● Caleb Caudle ● Doug Davis ● Dan Dockery ● Sam Frazier ● Jack Gorham ● Elliott Humphries ● Ken Mickey ● Tyler Nail ● Bruce Piephoff ● Laurin Stroud ● Lee and Susan Terry ● Skip Staples ● and more!